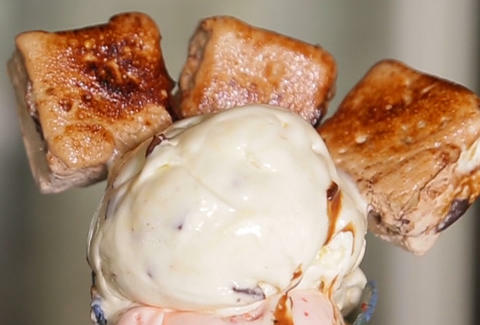 With no prior ice cream knowledge, Paul Kim and Ken Lo had no business getting into the ice cream game. Both quit their jobs to sell ice cream out of a cart on the sidewalks of NYC, before finally opening their retail location of Ice & Vice on the Lower East Side, which now has a cult-like following (and for good reason). This Vendy Award-winning, seriously experimental ice cream shop churns out small batches of frozen delights in original flavors you'd never expect, ranging from the seasonal (Devour Power with DogFish IPA and "lobster" croutons) to the semi-traditional (Milk Money with sea salt and chocolate). There's even a "Roulette" menu, where things get even weirder. If these flavor combinations aren't enough for you (and why would they be? ), there are also inventive cone flavors like birthday cake, salted blue corn & honey, and lime ginger & mint. You can also top it all off with a whole slice of spicy chocolate pie or rocky road and s'mores marshmallows. Check out the video below for more.